URL shortening services allow you to quickly and easily turn a potentially long link into a really small one. This is great in a variety of scenarios, from social media posts to email messages. They’ve become extremely popular, and are used extensively by a number of Web applications (at MailUp, we have our own URL shortening system that is used automatically when you post messages to social networks from your MailUp account). Although they can be a great way to include short & cute links in your email messages, URL shortening services should be used with caution because – unfortunately – the bad guys use them too! They are used by malicious users to hide harmful links behind a familiar look, such as that of a bit.ly URL. As they get misused, these services can end up on the “red flag for spam” list, and negatively affect your own messages, if you include them. 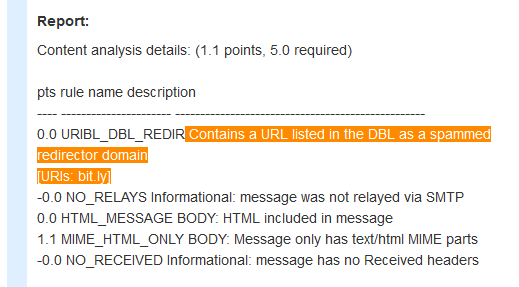 For example, recently Spamhaus again added popular url shortening system bit.ly to its domain black list or “DBL”. Su.pr – the URL shortening service used by Stumble Upon – is also listed (see table below). Since many spam filters use Spamhaus and other blacklists in their “is this spam?” algorithm, the inclusion of bit.ly- and su.pr-shortened URLs can negatively impact the deliverability of messages that include such links. 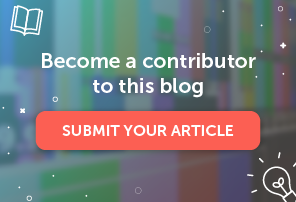 So, should you avoid URL shortening services completely? 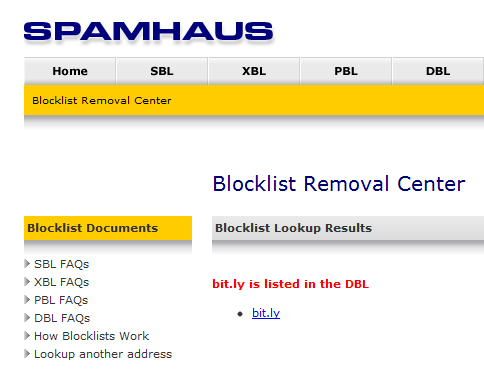 As the table above shows, even among the most popular ones, there are some that – at least as of today – are not blacklisted by a system like Spamhaus. What should you do? The rule is: “proceed with caution“. 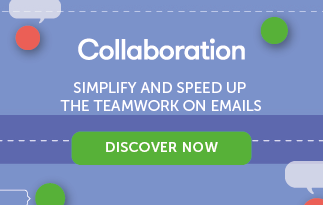 In MailUp, this means – for example – that you should always use the email Check-up feature before you send a message to your subscribers to find out if there are any issues. The Spam Check tab of the Check-up page will show links to domains that have been blacklisted, as shown in the screen shot below. All in all, email marketers can definitely take advantage of URL shorteners, but should do so with caution as the deliverability of their messages could be negatively affected if the blacklisted URL shortening services are used.